A couple of weeks ago my good friend and I decided to wear matching outfits to work for an entire week. Each day we chose a different colour and coordinated looks; towards the end of the week a few other colleagues joined in too. It was very fun, brightened up the week and gave me something to look forward to each day. These are our pictures from purple Monday. The focus on monochrome gave me so many ideas for outfits; at the moment I adore wearing outfits in one colour. For this look I added as much purple as I could find in my wardrobe and was happy with the results. This was my first time wearing this dress. 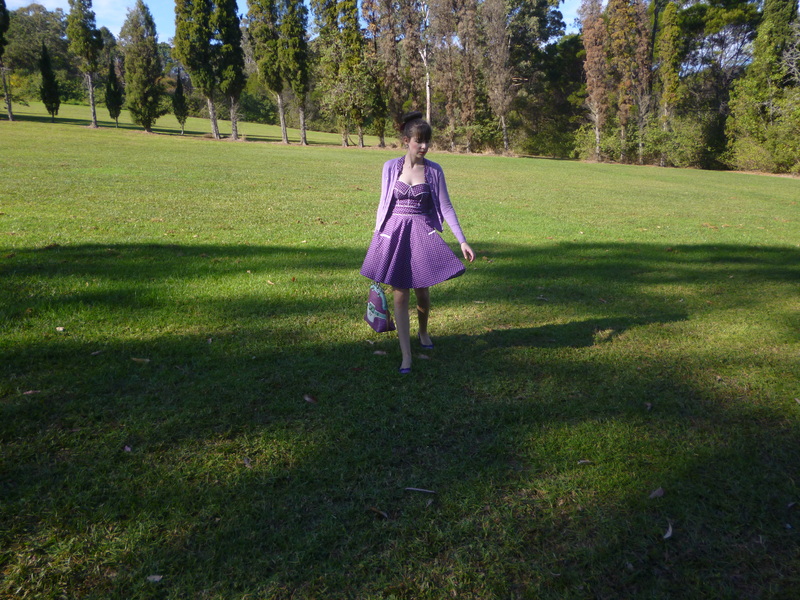 I purchased it last year from Modcloth and it’s the Boysenberry Buckle Dress by Hell Bunny. The reason I hadn’t worn it before was the length; it’s pretty crazy that it took probably six months to get around to having it hemmed. I know the vintage style of the dress suits the longer length but I didn’t think it was particularly flattering on me. I like the way it is much better now. The strapless style will be really lovely in the warmer weather. I added my glitter purple Guess flats because what is there not to love about sparkle!? This week I’ll be at law college instead of work which I’m extremely nervous about. I’ve always experienced extremely low confidence and deep feelings of insecurity around both studying and working in the law so I’m going to find this week extremely challenging. I have no interest in the law; my mind wanders continually and I’m generally thinking about fashion instead. The practical and role play style of assessments this week are just so incredibly far out of my comfort zone. The last time I physically attended college back in January (this is an online course with three weeks only of physical attendance) I was so unhappy and missed work immensely. I just cannot wait until it’s over. I’ll feel so much better about myself if I can get through it. On a positive note, I can sleep for an extra 40 minutes each morning this week in comparison with my usual work routine. 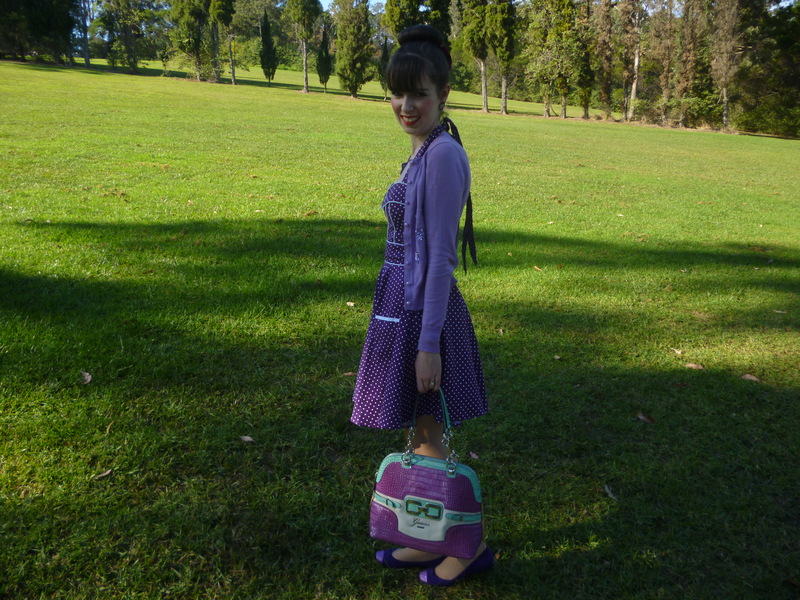 This entry was posted in Guess, Modcloth, Outfits. Bookmark the permalink. You're dress is absolutely gorgeous, love the cut! And the monochrome purple is so pretty. Sometimes you need to do something a bit different and fun to spice up the work week and it's so cool your coworkers played along! It's nice getting to see some of the clean modern office where you work, Your coworker and you both look fabulous wearing tour coordinating purple outfits whilst still looking very professional. Your Boysenberry polka-dotted dress and Alannah Hill cardigan look conservative in the office setting. 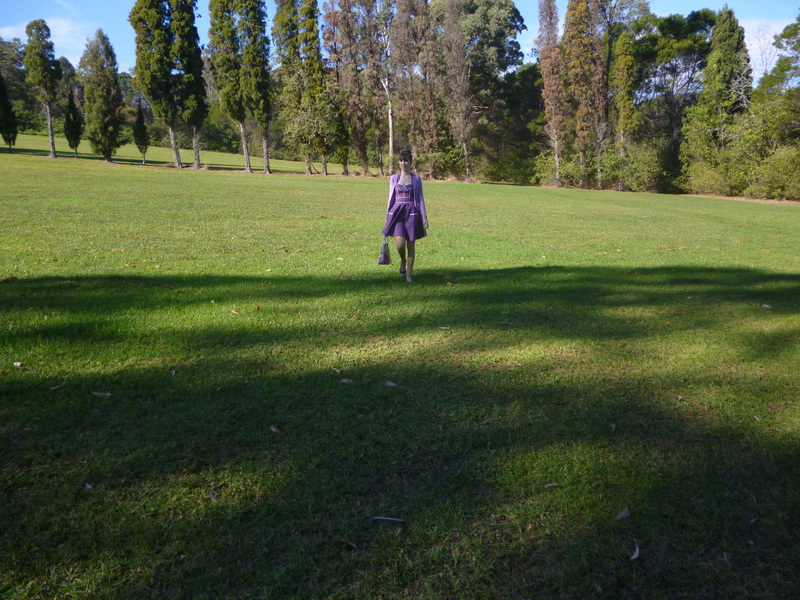 The photos of you out in the park show off the delightful swingy look of your dress. The convenient pockets of the dress and the fine white trim are very artistically designed and look pretty. I feel for you suffering from nervousness and insecurity having to do with studying and the law, but I know you have the intelligence, intellect and determination to succeed and I am certain that you will, brilliantly. There have been famous lawyers who worked together having very different fortes – one having strength in research and writing memorandums at law, and another having skill and presence in courtroom presentations. Working together they achieved a lot. Enjoy your extra 40 minutes in the morning. You look youthful and adorable! you look adorable in purple! This purple loook suits you so well! So cute! What a cute idea! You both look fab. That dress is amazing. That's a super fun idea, I am sure other colleague's would have enjoyed the matching outfits. Love this outfit, Hell Bunny is the bestest! Just a little friendly advice – it takes sooooo long for the images in your blog to load because you don't resize them before uploading to Flickr. There are sites like Pixlr (if you don't have Photoshop) where you can edit and resize the photos for free. For your blog, it's probably best to have a width of around 800px. I'm not being nasty or anything, just trying to help. Next pay day Im going to purchase that dress, I love it!!!! You look so lovely, I love your dress! Really lovely dress and cardigan, such a pretty colour.I hope the week is not too stressful for you. What a fun idea! Got to love purple 🙂 Hope school goes well for you! What a fun idea to wear matching outfits at work! It totally gives you something to look forward too! I just love the purple outfit! That dress looks amazing on you. The length is now perfect on you! Good luck this week at law college! I am sure you will be just great! Such a cute dress! Very 50s and pin-upy. Oh how fun to wear matching outfits to work with your friend, Imogen. It must have lightened up the work day for you. The purple dress is so cute, and I love the polka dots. This reminds me of the time that me and my friend took some pictures in the photo booth just to liven up a routine and dull work day. I love those purple shoes too, they're awesome! I love this lavender shade, you look so so pretty!!! And you and your friend look sooooo good. I love this matching thing you did! Love the polka dots, how fun!! What a nice polka dot dress, you look adorable! You look fantastic in that dress <3 Love the print and design! How lovely you both look, the boysenberry buckle dress is also pretty. Your dress fits you like a glove. Have a wonderful weekend. dear. I love this dress, it's my favorite color! I hope you do well in your class, I'm sure you will rock it! HI, I just stumbled upon your blog. You are so lucky having a job that you love so much. I am sure you know that. Btw. beautiful look!! What a delightful dress Imogen. The bust part is so pretty and I love that shade of Grape and Polka Dotssss! !